School of Information Sciences students Allie Penn and Laura Kennedy presented at the most recent meeting of the Mid-Michigan Digital Practitioners on November 1 and 2. 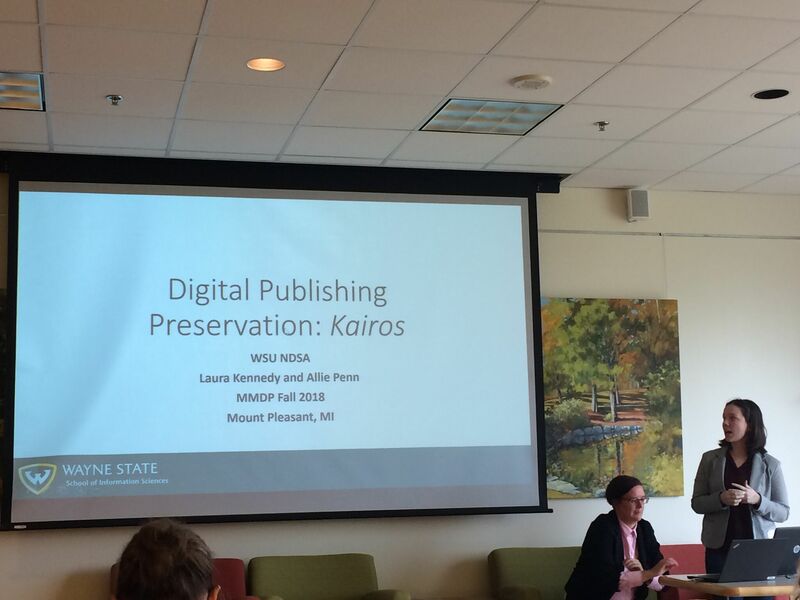 The presentation was entitled "Digital Publishing Preservation: Kairos." and it looked at the work of the Wayne State University Student Chapter of National Digital Stewardship Alliance. The student group has been working preserve the webpages that make Kairos, with a particular focus on the Adobe Flash and Shockwave files the pages use. The presentation examined three preservation methods: (1)converting the Flash and Shockwave files to MP4s; (2) screen capture; (3) using the Web Recorder software. Allie and Laura also presented on the same topic in October at the national NDSA conference. See their slides and notes on Google Drive.